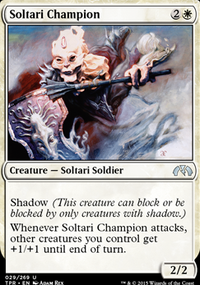 Whenever Soltari Champion attacks, all other creatures you control get +1/+1 until end of turn. 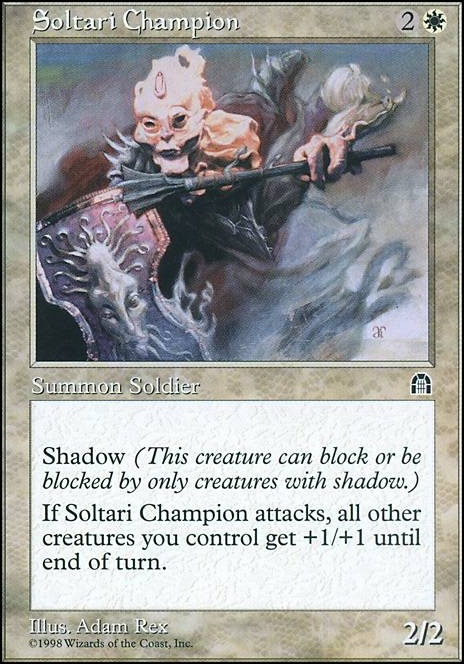 I think people underestimate the power of cards like Soltari Champion. Sure it doesn't look better than Honor of the Pure, but after factoring in that it's a creature, that is basically unblockable and that can be the target of teshar's ability, you'll see how it's that much better for what we're trying to do. Same can be said about effects like Capashen Unicorn. 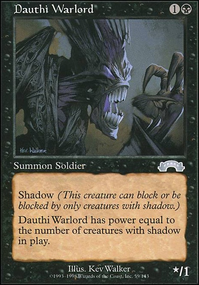 If you're putting sacrifice effects on the list I would suggest Mangara of Corondor, which even in the worst case scenario it's an exile effect. 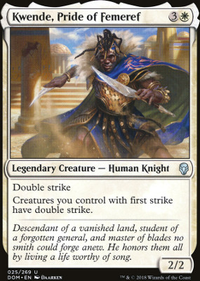 Two cards that missed me when I wrote the article were, Frontline Medic and Lieutenant Kirtar. The first is amazing as a way to force through damage and the second is a flying beater that has a strong removal stapled to it. If it were me I would probably cut Isamaru, Hound of Konda and Skyscanner. I also think you could replace Soltari Champion with something like Crusade which just outright gives a static buff. Nice deck, I've playtested it and runs really smooth. But it feels that some ofthe cards are there because they are good stuff and they don't perform as well as they would in other decks. Urabrask the Hidden feels redundant, all the important creatures in the deck already have native haste and you have Swiftfoot Boots and Lightning Greaves to provide haste. Making them enter tapped sure is nice, but there are many options for that in white if that is what you want. Elesh Norn, Grand Cenobite will always be amazing in any deck, but you are low on creatures and tokens to make it be a total beast. Mikaeus, the Lunarch Same thing, in the games I played my creature count was low. Plague Myr This guy feels out of place being the only creature with infect. I get it's a man dork and you can equip him some of the swords to make him unblockable but most of the time he is just sitting on the batttlefield waiting for a board wipe to happen. 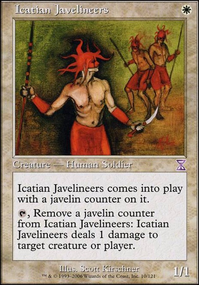 Kor Cartographer you have amazing mana ramp on the deck that make this guy irrelevant. You can't capitalize on it's ability either, no flickering or recurrent reanimation. Michiko Konda, Truth Seeker It's hard to tell how good is she without playing a real game . It feels she is good against small attacks, but the bigger ones will gladly sacrifice some token to make you the damage. I'd take her out because it's meant to aliviate the pressure on you and you are the one making the pressure on others, you want to push your opponent against the ropes, and this cards is not helping you to that end. I'm missing card draw, I tend to run out of cards. While I have Mind's Eye or Sword of Fire and Ice it's all good, but if it gets destroyed I'm in trouble. 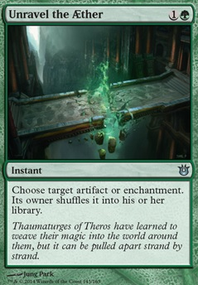 Together with not drawing cards is not having some mana dump, there's nothing to do with all the mana from Neheb, the Eternal. Depending on the way you want to take with your deck different cards would solve these problems. Anyway, some cards I would add anyway because are really good with Aurelia not mattering about the rest of the deck are Angel of Condemnation, Etali, Primal Storm and Glorybringer. It feels you have a flying theme going on, you could capitalize on that with some Earthquake-like spells. Sigarda's Aid would be a great asset because most of your equipments give some kind of protection. With this enchantment they wouldn't just become combat tricks but also reactions to removals and board wipes. Even if you have no equipments in hand your opponents won't know, so it's still playing mind tricks on them. 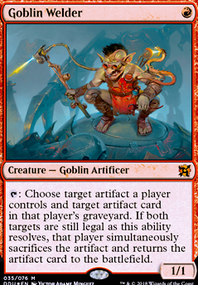 It comes to my mind more suff that trigger when you attack Captain's Claws, Goblin Rabblemaster, Hero of Bladehold, Brimaz, King of Oreskos, Launch the Fleet, Soltari Champion, Accorder Paladin, Goblin Wardriver, Hero of Oxid Ridge, Wingmate Roc, Frontline Medic, Firemane Avenger. Or when they deal combat damage Prophetic Flamespeaker Skeleton Key, Mask of Memory, Rogue's Gloves, Specter's Shroud, Destructive Urge, Markov Blademaster, Slith Ascendant, Blinding Angel, Falkenrath Marauders and any of the "sword of A and B". And more Extert Angel of Condemnation, Tah-Crop Elite, Glorybringer. I'm always looking for a Boros deck to run the Sunforger too bad you have so few instants. Card draw is hard in Boros, so I'd also try to use Staff of Nin, The Immortal Sun together with the Ghirapur Orrery you already included. I hope you find something useful among these cards. Picked up some new cards at PAX weekend.